Cleansing is one of those daily rituals that brings a multitude of benefits to your skin, as well as your body via your senses. Find the right cleanser for your skin, use it twice daily, making sure you cleanse your skin thoroughly, but without stripping it & you are one step closer to having beautiful skin. Today I want to introduce the latest launch from Spanish brand Dafna’s Personal Skincare called Recovery Cleanser to you. When I first came across this Spanish brand, I was surprised that it didn’t have a cleanser among its products, but as I got to know Dafna, brand’s founder & mother of two, I understood that she won’t launch something unless she was happy with what the product will achieve. Combining scientific research, careful ingredient selection & Ayurvedic principles, each product aims to deliver so much more that just skincare benefits to its customers. 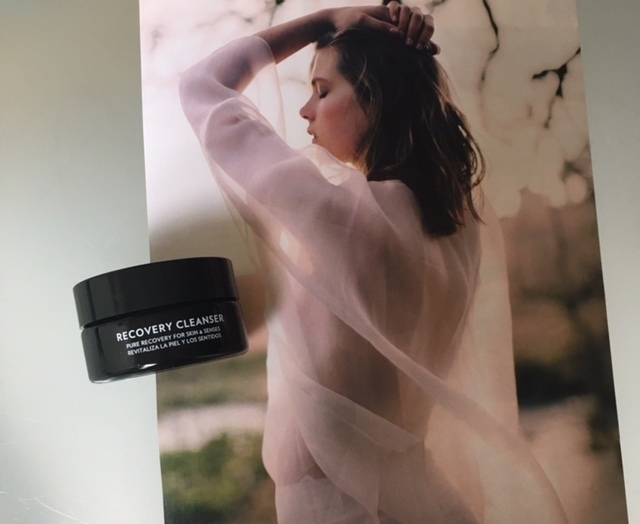 Recovery Cleanser has a texture of a balm, but as you massage your face & neckline with it, adding water, it changes to a milky consistency, imparting a veil of nurture to the skin. The centre of this cleanser is created around nutritive & antioxidant-rich organic oils of Moringa, Bamboo & Argan, which help remove make-up & grime that we accumulate daily, when our skin comes into contact with the elements, as well as purify the skin. Lemongrass essential oil helps to detoxify your skin, while its scent calms your mind & Calendula Extract reduces skin discomfort. When Dafna started developing this cleanser, she thought long & hard about her own experiences with cleansers, considering texture, effect & benefit for the skin, scent, as well as the things that she didn’t like when using a product to cleanse the skin. This lovely woman has a a very calm disposition about her, even though she balances her work with motherhood & I just can’t imagine her rushing in her creative process. Good things take time & effort to create & Dafna wanted women who use this cleanser to not only feel & see the difference in their skin, but to give them a moment of calm in their busy lives, something that as a mother really resonates with me. She considers oil to be more ‘profound’ when it comes to make-up & grime removal from the skin, so incorporating a few of them led her to create a balm that becomes quite milky when it comes into contact with water & ultimately benefits your skin, doesn’t make it feel or look de-hydrated, while cleansing it effectively at the same time. Her aim was to create a cleanser that will give you a feeling of beautifully clean skin, was easy to remove and be practical in terms of the multitude of benefits. When Dafna was playing with textures during the creative process, she was conscious that many of us travel & take our cleansers with us, so a product that is solid is somewhat preferable. One of the things worth pointing out is that this cleanser combines oils & shea butter in its formulae, which allows the balm to stay ‘solid’ in the jar, so you can rest assured that it won’t ‘leak’ in your luggage. We crave balance when it comes to our lifestyle, why not start with incorporating a skincare product that has balance at its core into our daily skincare routine ? Can be left on the skin for a few minutes for some extra nurture or overnight on clean skin as a mask. When Dafna & I met during her last visit to London in April, I, of course, took advantage on an opportunity to catch up with her, as well as quiz her about the cleanser. I was also quite intrigued, when she suggested cleansing skin not twice, but three times a day. As city dwellers, we can all judge the state of the environment by looking at the windows. When my window cleaner comes over, I love catching sunlight through the windows as I work, cook, do chores or just pause to look at the sky & clouds floating by, but within a few days the glint gets lost in dirt that starts to accumulate. Now, think about what that does to our skin, which is exposed to it daily, as we move across town for work, school runs, meetings, lunch breaks or errands. So, Dafna draws on that and suggests that even when you work in the office, it’s worth taking five minutes to go to the bathroom, brush your teeth after lunch, cleanse the skin, luxuriating in the sensation of five minute beauty break, re-apply you serum or moisturiser, as well as make-up and get back to work, knowing that you skin’s ‘breathing’ just got a little bit easier. Such approach probably helps improve skin’s ‘health’ as well. In the last few months I also developed a habit of cleansing my face as soon as I am back home, knowing I won’t be going out again that day. I let the water wash the grime & negativity that I might have experienced down the drain, smile at myself in the mirror and get on with the rest of my afternoon or evening, allowing my skin to regenerate & luxuriate in the clean calmness of the sanctuary that is home, having applied my evening skincare products earlier & letting them get to work on environmental damage & ageing process, as I cook, spend time with my family and work. Take a pearl-sized amount of balm & massage it into your dry skin. Leave to ‘act’ for a few minutes, then rinse thoroughly with warm water. For extra nutrition, leave the balm on for a few minutes, before washing off. You can also apply the balm to clean skin & leave it on as a nurturing overnight face mask once a week. As with any beauty product, there are beauty hacks & I urge you to find a way for the products to work for you. Example: when I first started using this cleanser, a week or so after I noticed little spots & tightness around the apples of my cheeks. I was using the cleanser in the evening, massaging it in, following it with Dafna’s Anti-Ageing & Glow Serum & Nutrition cream & but my skin looked fine in the morning. I reached out to Dafna, explaining my predicament & she told me to use less of the balm or to massage it in less – I will be honest, I used the size of a large, not small pearl to start with & was feeling run down & stressed at the time. Within a couple of days of using Dafna’s tip my skin settled down & the same issue hasn’t come up since then, several weeks on. Dafna also reminded me that in spring, as nature wakes up, our skin can become a bit more reactive, due to increased pollen count among other things. This is something worthy of consideration, if you suffer from hay fever or skin sensitivities, but those issues come up for people with none of those issues too, so do pay attention to your lifestyle, skin & what’s going on outside your window in terms of the weather & seasonality – it all works together ! Another interesting element of this cleanser is its smell. Dafna managed to combine healing & refreshing qualities of ingredients, harnessing Ayurvedic knowledge, so depending on your mood or internal needs, the cleanser gives you different perspectives. It has a warming, refreshing smell of orange & lemongrass undertones, a combination of which, when it opens due to the heat of your skin, becomes comforting & reassuring, like a trusted friend. Scent is such an important part of our skincare, as scent can & does affect our mood & state of mind & for me it forms a very powerful element of my skincare ritual, where I savour those moments of peace & self-care, like a cup of warming tea on a cold day. I have combination skin, but due to the fact that I test a lot of skincare on my own face there are times when my skin gets pissed off with me & makes its opinion subtly obvious to me. As this cleanser has a balmy texture, I prefer to use it in the evening, in order to cleanse my face thoroughly – I definitely have more time for myself in the evening than in the morning, when organised chaos of getting kids & myself ready for the day ahead rules the roost. I have been using Dafna’s new cleanser alongside her Anti-ageing & Glow Serum & Moisture + (beautifully scented, it includes 19 ingredients, including Hyaluronic acid, Argan oil, Bamboo, Plantar & Mimosa extracts that help to hydrate & renew your skin, while Neroli essential oil lifts your spirit, as you get ready to start the day. It is more light-weight than Nutrition, so complements your serum & helps create a smooth canvas for make-up application as additional bonus) in the morning & Serum plus Nutrition in the evening, so it slotted perfectly into my skincare ritual. After I got over the original hiccup of using ‘too much’ of the cleanser in my enthusiasm, we found a natural rhythm. As the weather gets a bit warmer I end up use a little less of the cleanser, yet it work as effectively – you really need to find your own way with each skincare product you choose to put on the skin. I also draw comfort from the smell of this cleanser, as it fairly quickly calms & centres me, as I take longer, deeper breaths, as I apply it – a practise that is so beneficial for your skin & body, as you draw more oxygen in, as opposed to the day, when most of us breath fairly shallow in our rush to get from Point A to Point B. I also find that Dafna’s recommendation of using it after cleanser on clean skin as an overnight mask once a week works well, if my skin feels a little drier (I am not helping my case when I don’t drink enough water ) & the mask helps to make it up to my skin for my short comings. I also like how it feels on my skin & allows my fingers to slide over my face, as I massage it into all the grooves, unknotting the tension, without any drag. Bio Moringa Oil: obtained from the seeds of Mooring Oleifera, this oil originates from the Himalayas, where it is known for its efficacy in combatting harmful effects of the sun. It has about 46 powerful natural antioxidants, including Quercetin, Kaempferol, Beta-Sisterol, Zeatin & Caffeoylquinic that help control the ageing process. Bio Virgin Argan Oil: known as the liquid gold, it is rich in natural antioxidants, essential fatty acids, sterols, carotenoids, ferric acid & polyphenols. Bio Bamboo Oil: bamboo leaves contain flavonoids, which confer antioxidant properties. Its antioxidant powers are delivered through the mechanism of neutralisation of the free radicals, as well as inhibiting radical reactions. Lemongrass essential oil: a traditional Ayurvedic medicine from India, it is often used to deal with infections & fever. It also helps to reduce stress levels, as it imparts sedative powers via its soothing aroma. Calendula Extract: due to its rich content of saponins & mucilages ( a thick, glue-like substances produced by many plants in order to store water & food ), it has wonderful humectant & healing capacity. Ingredient List: Olea Europaea Fruit Oil, Butyrospermum Parkii Butter, Prunus Amygdalus Dulcis Oil, Cetearyl Alcohol, Sorbitan Stearate, Lecithin, Disodium Cocoamphodiacetate, Argania Spinosa Kernel Oil*, Moringa Oleifera Seed Oil*, Helianthus Annuus Seed Oil*, Bambusa Vulgaris Extract*, Glycine Soja Oil, Calendula Officinalis Flower Extract, Salvia Officinalis Leaf Extract, Citrus Sinensis Peel Oil, Rosmarinus Officinalis Leaf Oil*, Cymbopogon Flexuosus Oil*, Squalane, Coco-Glucoside, Glyceryl Oleate, Maltrodextrin, Beta-Sitosterol, Tocopherol, Limonene*, Linalool*, Citral*, Citronellol*, Eugenol*, Geraniol* (* Organic active ingredient with Bio certification).